EXECUTIVE SUMMARY: The concept of “settler colonialism” has been applied with almost unique vehemence against Israel. But the fact that Jews are the indigenous population of the Southern Levant can be proved with ease. In contrast, historical and genealogical evidence shows Palestinians descend primarily from three primary groups: Muslim invaders, Arab immigrants, and local converts to Islam. 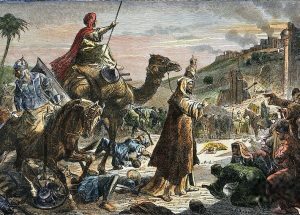 The Muslim conquest of Byzantine Palestine in the 7th century CE is a textbook example of settler-colonialism, as is subsequent immigration, particularly during the 19th and 20th centuries under the Ottoman and British Empires. The application of the concept to Jews and Zionism by Palestinians is both ironic and unhelpful. Nice try. I will consider these arguments as soon as the White Americans get out of USA and hand over control to the Native Americans, whose land they stole. justice has to be for all and equal to all.